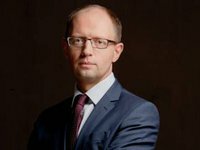 Former Ukrainian prime minister and head of the political council of the People's Front Party Arseniy Yatseniuk has said that his team became stronger after the political crisis of 2016, as a result of which he resigned as prime minister. "It's a pity that our coalition partners acted short-sightedly. I expected full support from the president. The president made a mistake. What can I say to the president? The standard answer in Ukrainian politics is that we are going into opposition... Now I want to answer President Poroshenko. Mr. President, thank you for the experience, we have become stronger," he said at a congress of the People's Front Party in Kyiv on Saturday. "I hope that all participants in that political crisis drew the conclusions and will not make such mistakes in the future," the politician added. "These are people who are far from politics, including Ukrainian politics. Politics is not guest appearance, and statesmen are not guest performers," he said. At the same time, Yatseniuk said that at present the fate of the country depends on the unity of all branches of power. The politician also thanked the party for unity. "We have a very long and difficult road ahead, and now the party should unite as much as possible to carry out our action program," he said.